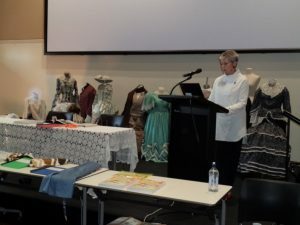 I’ve just returned from The Australian Sewing Guild’s (South Australian) Inspiration Day. It sure was inspiring! I was the first speaker of four (which worked out well for me, because then I could relax and enjoy the rest of the day), and for my talk I was interviewed by Anthea Martin. 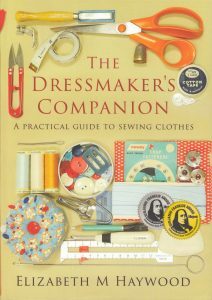 She asked me about sewing, my career, The Dressmaker’s Companion, and I demonstrated some sewing tips. The other speakers were all so interesting I wouldn’t have minded if they’d talked all day! Annie Basham showed her collection of reproduction clothes from the 1700’s and 1800’s. All had been worn for various events. 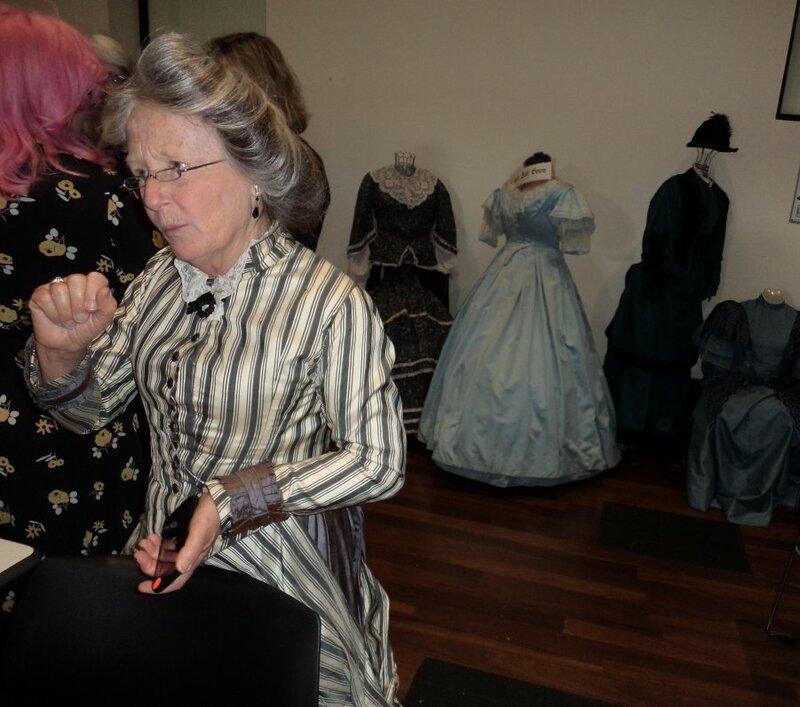 There were men’s clothes, day and evening gowns and corsets. She turned garments inside out and showed us the interior construction, padding and hoops. What was so great was that Annie actually wore a dress she’d made from the 1870’s, and she wore it all day. It was striped silk with extravagant trims around the skirt (I’m sorry you can’t see the skirt in this photo; it has a train as well). She wore it to set up her display, do her talk, socialise, pack up the display including carrying everything out to the car park and packing the car, and I imagine she drove home in it too. So as well as talking about making these clothes she talked about wearing them too. She demonstrated how to sit and walk, and talked about getting dressed in them. 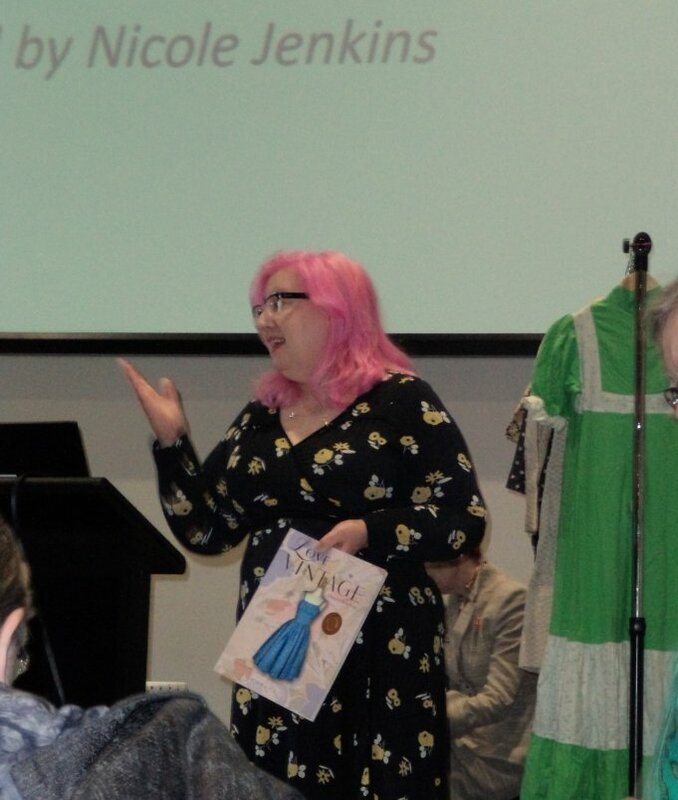 Nicole Jenkins, pink-haired and beautifully spoken, walked us through fashion from the 1920’s to the 1970’s. She brought examples from her enormous fashion collection and showed other examples on the screen. All this was interspersed with fascinating stories of how she came by a particular garment, care of clothes, garments that had been photographed for her book, how to spot an original, olden-days fabrics and ill-treatment of vintage clothes. ASG president Louise Sparrow finished off the day with a technical talk on patternmaking, a subject close to my heart. She walked us through several ideas on splicing patterns, shifting darts and adapting patterns. She passed around cute half-sized garments while she spoke. 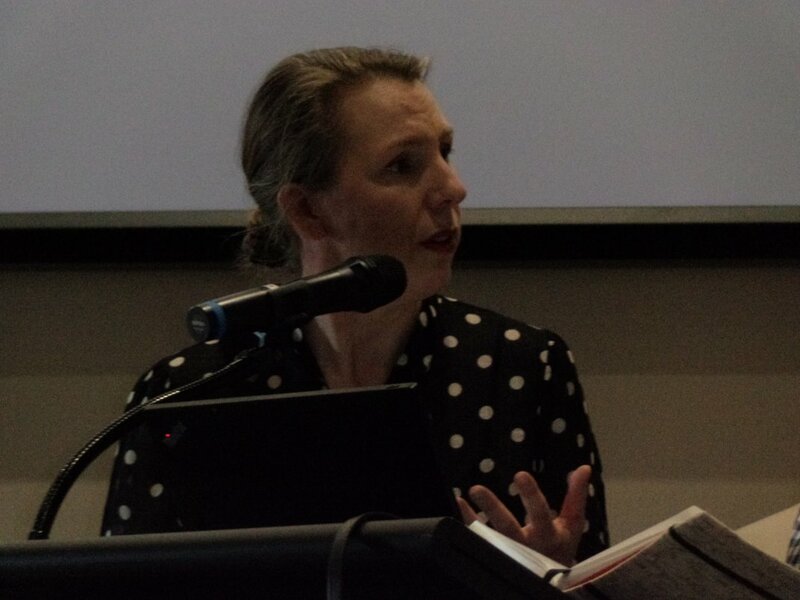 It was a really fun day; many thanks to Susan Fulop and team for organising a wonderful event. I was fortunate to attend, and how I found out about your blog. Thanks for coming to talk about your book Liz and giving us some behind the scenes information about the process of creating a book, it was very interesting. The other speakers were inspiring and showed their passion for their area of interest. 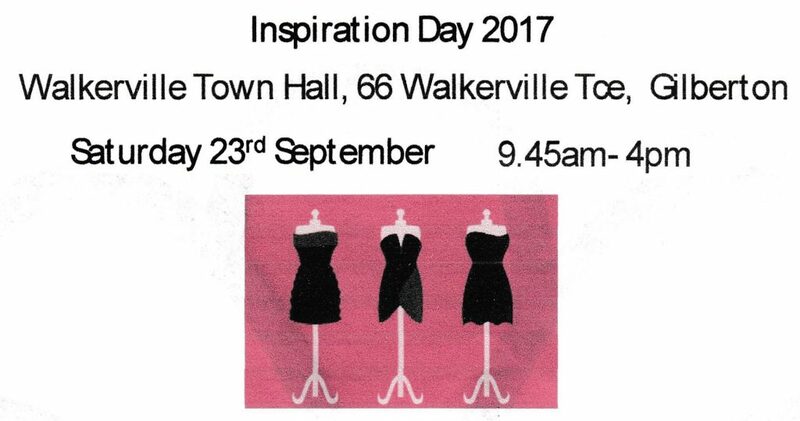 There was some talk that it was the best South Australian Inspiration Day we’ve had. So thankyou for making it a great day. Yes, it was a fun day; I enjoyed myself enormously!